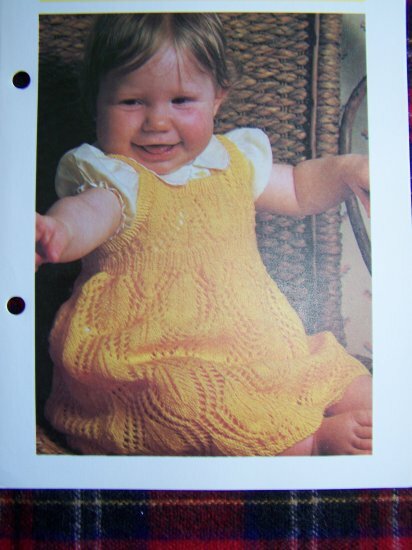 USA 1 Cent S&H 1980's Vintage knitting pattern Babies and toddlers; Precious baby leaf pattern pinafore dress knitting pattern. Original pattern not a copy. Includes only the pattern not the completed item. Book 3. Find more patterns like this one in my store. Pattern name: Young children; Leaf pattern pinafore. Measurements: To fit 6 - 9 Months. Length from back of neck approx 16". Knitting Needles: 1 pair each of # 4 and # 5. 2 stitch holders. This pattern was removed from a two ring binder and some have edge curl from being in a binder for so many years. S & H to Canada $1.50 folded in a long envelope. Ask about combined shipping.